This thread will track our progress repaying the mortgage on our home early, as we make additional principal payments with extra money we encounter throughout each month. Our goal is to own this home outright no later than eight years from the purchase date, which would be June of 2022. Next I’ll post some background and some info on our methodology. Here is where we currently are. I'll update this monthly. I recently created this post celebrating the early payoff of the mortgage on our second home. After 11.5 years of regular payments, we repaid the last ~70% of the original loan amount in just 18 months. We accomplished this by redirecting any extra money toward extra principal payments. A significant chunk of our recurring employment income goes into our retirement and investment accounts automatically, and we left that alone. We didn’t deviate from our regular saving/investing plans at all. · Cash rewards redemptions from credit cards, Ebates checks, the annual birthday check from Grandpa, etc. No amount of extra money was too small to ruthlessly track until the end of the month and include with the next mortgage payment. With that mortgage fully repaid in December of 2017, in January of 2018 we began the same approach with the mortgage on our primary home, which is our only remaining debt. In addition to the recurring amounts we were paying on the other mortgage, of course, we are now adding in the P+I portion of the mortgage which was just repaid. Kudos to you for being so disciplined. I recently downsized my car and my new payment is about $500/mo less. I've been debating about what to do with that because it's already in the budget. Thus far I've just been transferring the previous amount into my DCU checking and paying the new amount from there so it's building up a balance. But I feel like my cash savings is lower than I'd like after the BK and buying back my house from the trustee for 50k earlier this year so I'm kind of leaning towards continuing to keep it in cash for now. But eventually I'd like to be as excited about paying off my mortgage as you. The basic methodology would work for [insert financial goal here]. Best wishes for whatever useful purpose you find for the money. With the additional principal payments we've made so far in 2018 we have already taken almost seven years off the end of this mortgage. Put another way, If we were only making regular payments it would have taken us until February of 2025 to get our balance to where it is today. With another tweak I can make this accelerated repayment go incrementally faster. We just made changes to our insurance carrier and our coverages, which resulted in a 7.9% annual savings. Beginning with the 6/1/2018 mortgage payment (and continuing every month) I will be adding 1/12 of our annual insurance savings to the extra mortgage principal payments that were already planned. Due to the size of our recent tax refunds I have adjusted my withholding. I'm taking the additional cash that's coming in every month and making it a permanent addition to our monthly mortgage payment. I also recently canceled my myFICO subscription, and that 29.95/month is also going toward the mortgage every month. The extra principal payment for June consisted of our standard monthly amount, which represents permanently eliminated debt payments and monthly expenses, previous net salary increases and the result of the recent payroll withholding adjustment designed to eliminate annual federal tax refunds. If we hadn't made any additional principal payments we would have only repaid 5% of the original loan balance at this point. 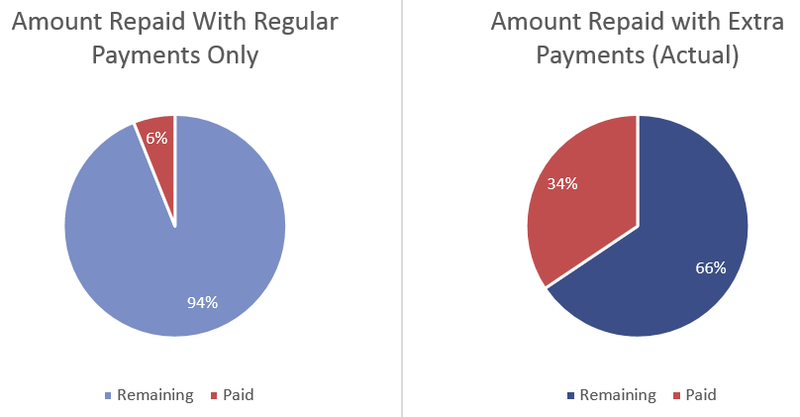 With the repayment acceleration that we started in January of 2018 we have actually knocked down 23% of the balance. 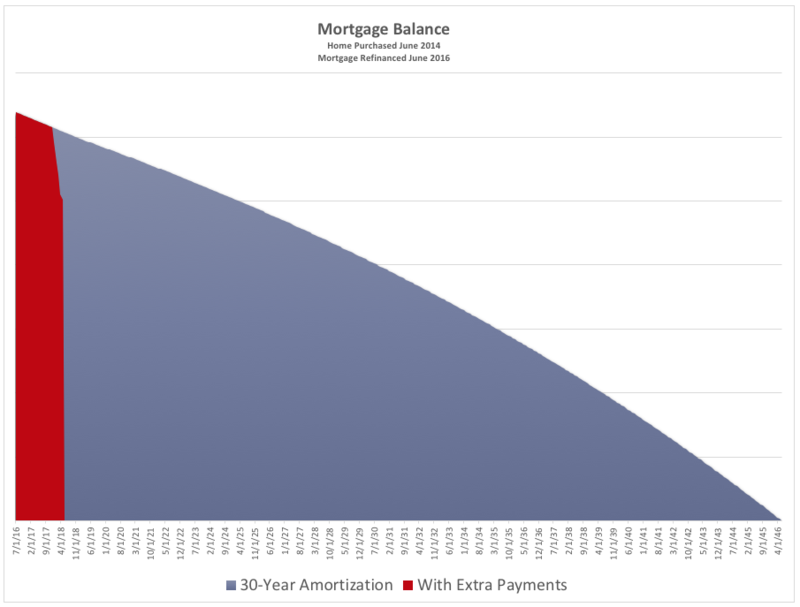 Our balance is currently where it would have been in July of 2025 if we hadn't made the additional principal payments, so we're currently just over 7 years ahead of the 30-year repayment term for this mortgage. Proceeds from the sale of some stock in my ESPP after it passed the 24-month required holding period. There was other unallocated money that came in recently, but we used that to pay for unanticipated household expenses (new HVAC system, new water heater) and some vacation expenses for our upcoming trip to the UK next month. We just made our 25th payment on this mortgage. If we had only made the regular payments we would have just short of 28 years left on this loan. At our current rate of accelerated repayment, however, we have repaid 27% of the original balance, and we will have the entire mortgage paid off in the next 2 - 2.5 years. Back in the 80's my mortgage payments drove me nuts. They didn't take payments in advance and I hated writing checks every month. My CCs let me overpay so I could just ignore bills without opening them until a red envelope arrived so I'd only have to write checks every 6 months or so. Getting sloppy writing mortgage checks resulted in some very negative bills. I got tired of foreclosure threats and just paid if off when I realized I had enough in the bank. This was about the time Amex closed my gold card which, oddly, was the only bill I was always current on. Mostly because I didn't use it much at the time so there was rarely a bill to pay. I hated writing checks. Funny thing is I never got AA from any of my Visa/MC cards at the time but they were well aware of my patterns. I even had high limits, a 40k and 60k card in the 90's. Stupid me, I started using debit cards for everything and eventually the CC issuers stopped renewing my cards when they expired. And that's how I came to be one of the underbanked without any credit until 2009 when I realized CCs were useful and fraudsters couldn't drain your bank accounts. I'm a slow learner but eventually caught on. Your progress is a concrete example of how just paying off a little extra each month can make a significant difference. For example, if you pay your mortgage bi-weekly rather than monthly (which basically amounts to 1 extra payment/year) you will knock ~7 years off a 30 year mortgage. That's definitely one of the messages I want to demonstrate with this thread. Living well below our means was an important precursor to being able to execute this plan... you simply cannot pay extra money you do not have. I took a month off from this thread, but here is a new update. In addition to the standard amount we pay extra every month (mortgage payments we no longer make on our other house, net salary increases, eliminated nonessential expenses, etc. ), here are a few selected highlights from the August and September additional principal payments. There were other additions; I'm highlighting these because I am focused on even the little things. As of the September payment we have repaid 30% of the mortgage on the house we purchased just over four years ago, in June of 2014. The first pie chart shows how much we would have repaid if we had only made the scheduled principal and interest payments. 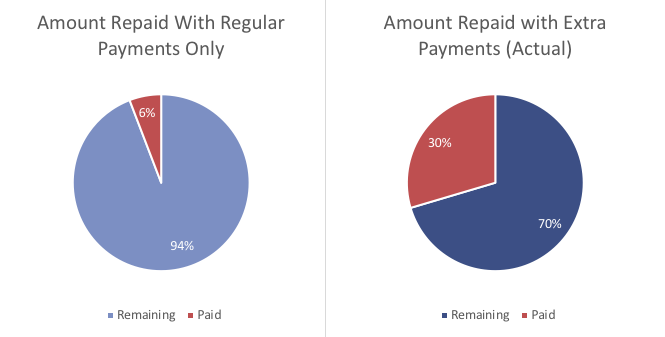 The second pie chart shows our current, actual repayment progress. If we had only paid the regularly-scheduled payments it would have taken us until January of 2028 to get our balance down this far, so we are currently more than 9 years ahead of schedule. Great post & congratulations on the progress so far. I’m just kicking off an effort this month to accelerate paying off my mortgage too. One quick question: are you just adding tracking the extra, then paying it along with your regular payment or are sending in interim principal payments? i have my payments on an auto-ach plan and they won’t let me make an extra interim ACH transfer. I am not sure how that works when you are on ACH. That is why I do not want to be on ACH with anything like a mortgage or car loan, because I do like to add on extra every month. I'm going to give a long answer to your quick question. The 3/1 ARM product we have on this house also required us to have our regular P+I payments on auto-pay via ACH. This was a small tradeoff for the phenomenal loan terms we got (we have ~10 months left at 1.74%). So our extra principal payments are made separately, all at once, once a month. The note on our ARM works differently from the notes on fixed/conventional loans sold to the GSEs (Fannie, Freddie) in that the payments are credited for interest calculation purposes on the day they are received. Conventional loans generally only allow one principal reduction per month as of the 1st of each month. So technically I would be marginally ahead making several smaller payments throughout the month, but I haven't gone quite that far off the deep end. It's always a good idea to check with your servicer in advance to find out how they'd prefer you to make additional principal payments to ensure that they post correctly... mainly because it will save you time and aggravation trying to get things reversed if they misinterpret your intentions. Let's say you have a $1,000 payment, and your regular payment gets pulled on 10/1. Then on 10/18 you make an extra $1,400 payment, intending that to go to principal. Unless you know in advance how they want your intentions specified, they could very well apply the first $1,000 to your 11/1 payment and $400 to principal. They might even still pull $1,000 on 11/1 and call it your 12/1 payment. Gets messy pretty fast if you have to undo this. I haven'﻿t﻿﻿﻿ gone quite that far off the deep end. I spent all weekend watching YouTube videos on how to accelerate mortgage payments so I may be off the deep end! thanks Forbes the response. I will give them a call tomorrow. My preference is to leave the ACH on. I’ve worked hard to get my finances clear. My reports are, at long last, nearly 100% clear, so I sleep better at night with everything automated so I can’t accidentally forget and mess it up. do you want this thread to track your own progress or do you want it to become an ‘early payment superthread’? I created this thread with the intention of posting my progress, but I haven't patented the idea. I'd consider it a compliment if you started one like it. You would undoubtedly bring a different perspective to your narrative than I have/will. We are 2.25 years into this mortgage, and with this month's additional principal payment we have repaid more than 1/3 of the original loan balance. If we had made just the regularly-scheduled monthly payments we would have chiseled off just 6% of the principal (and we would have almost 28 years of payments left). $12.36 in accumulated interest in our DCU savings account (every little bit helps). As a reminder, we kept our previous savings and investment plans in place, but simply redirected "extra" money that wasn't allocated for other purposes to mortgage repayment. We also haven't compromised our enjoyment of life (vacations, reasonable discretionary purchases, gifts, charitable donations, etc.) because those were already part of our spending plan. Any chance you can share a generic version of your spreadsheet that graphs the accelerated principal payment vs the standard amortization? I think it could be a useful tool for us. When I have a bit of dedicated time I will see what it'll take to strip out personal details and create a shareable version. ... and lightly customized it. We have A 3/1 ARM, which is why I chose this template. It lets you change the interest rate on the fly. Today I started the process of recasting this mortgage. Recasting takes the current balance and reamortizes it over the remaining term of the note. With our lender all that is required is signing a two-page agreement. There is no fee. As of 12/1/18 our scheduled payment will go down by ~34%. We are not deviating from our accelerated repayment plan, the only change will be a smaller required monthly P+I payment. I was pawing through some old email last night when I was reminded that back in August, Lending Club sent me an email reminding me that I had $0.08 in an account that I hadn't used in over three years. I transferred the $0.08 to my USAA savings account (the only bank account linked to my LC account 🤷‍♂️) and forgot about it. I'm adding this $0.08 to our November mortgage payment, making this this smallest single principal contribution to date. I considered making a separate $0.08 principal payment today, but after pausing for a moment I realized that I've finally found an amount too small to matter. With that said, it isn't the tiny incremental contributions that are making this mortgage repayment plan work; it's the mindset and the discipline. Do all mortgage lenders Recast? where can I learn more about this? Call your servicer and ask about their specific process. I don't think it's uncommon to have the option, but I think there is usually a bit more paperwork and a fee of a few hundred dollars. The lender we used kept the loan in its portfolio (vs. selling it to a GSE or some other investor) and they retained servicing, so some of the specific terms and procedures will be different if you have, say, a conventional 30-year-fixed that's owned by Fannie Mae or Freddie Mac.